Mutographs project manager Laura Humphreys reflects on what the project has achieved in 2018, and highlights what the team will be up to in 2019. The last year has been great for the Mutographs team, with progress being made across all areas of the project. We were also busy outside of the lab as we launched this website, helped shoppers in Cambridge to be ‘Cancer Detectives’ and found out more about how oesophageal cancer affects people in Kenya. Throughout the year, we have been collecting tissue samples from people affected by five forms of cancer across five continents. These samples will help us to understand why some cancer types are more common in certain areas of the world. DNA sequencing and analysis is in progress or completed for over 2000 samples, thanks to the efforts of Paul Brennan’s team at IARC and Mike Stratton’s team at the Sanger Institute. During 2018 we had a particular focus on collecting samples of oesophageal squamous cell carcinoma. We have collected over 1000 samples so far, donated by people from all over the world including Brazil, Kenya, Iran and Japan. Many of these samples have been fully analysed and the data has been released to the Mutographs team for further analysis, but there is still plenty more to do. Analysis of the oesophageal squamous cell carcinoma samples so far has found a distinctive DNA signature related to the actions of a group of enzymes called APOBEC. APOBEC naturally occurs in the body where it changes the structure of cytosine, one of the four building blocks that make up DNA. Evidence suggests that APOBEC is overactive in people with oesophageal squamous cell carcinoma. Our findings line up with the current evidence and show the need for further research into how APOBEC might be connected to this form of cancer. The Mutographs team are comparing samples of oesophageal squamous cell carcinoma from areas where there is a high risk of this form of cancer and other areas where the risk appears to be lower. This will help us to spot whether there are any differences between the samples that could shed some light on APOBEC’s role. Over the next year, we will continue to analyse the oesophageal squamous cell carcinoma samples. We are also going to focus on collecting and analysing kidney cancer samples. These samples are being donated mostly by people from Eastern Europe, including the Czech Republic, Serbia and Russia. A lot of scientific research involves making sure that the methods used are the best ones to get the accurate results that we need. We have spent a lot of the last year working to improve some of the research and computational techniques needed for the Mutographs project. For example, Ludmil Alexandrov and his team at UCSD have been refining the computational methods that generate the DNA signatures we use in our analysis. This will mean that all Mutographs teams can access reliable and useful data. 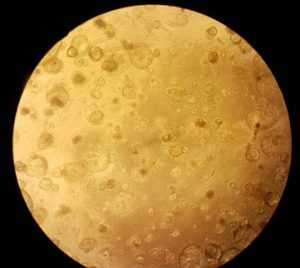 David Phillips and his team at King’s College London are also working on ways to help mini-organs grow in a dish so they can be used in the project. One of the aims of the Mutographs project is to find out whether there are any new DNA signatures that could be linked to causes of cancer. Work from Allan Balmain at UCSF has uncovered potential new signatures in mice. And Peter Campbell and his team at the Sanger Institute have also been finding out what signatures exist in lung and liver tissue that is not affected by cancer. This work will help us understand what changes occur in normal tissue before cancer develops. This will help with analysis of the cancer samples that are being collected from patients. Visiting the College of Health Sciences, Moi University, Eldoret, Kenya. 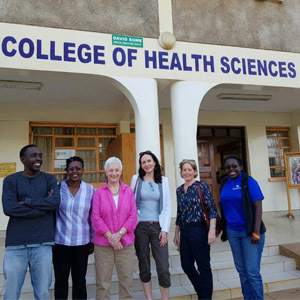 In 2018, our patient advocates Maggie Blanks and Mimi McCord travelled to Kenya, along with journalist and author Kat Arney. 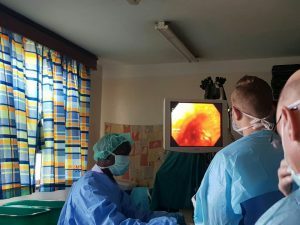 The purpose of the trip was to discover how cancer affects people living in rural Kenya and learn more about the cultural and healthcare landscape in the region. Kat’s blog details more of what they discovered there. We are planning on travelling to the Czech Republic in 2019 to meet healthcare professionals and patient organisations. The Czech Republic and other countries in Eastern Europe experience high levels of kidney and pancreatic cancer and it is not clear why this happens. Throughout this trip, Maggie and Mimi hope to understand how cancer healthcare in the Czech Republic works, and how the patient experience compares to the UK. They also aim to find out how any results from the Mutographs project can be best used to benefit patients and their family members in the country. Keep an eye on this blog as we’ll be bringing you updates and news from the Mutographs project throughout 2019.